New Item! Expected to Ship 05-13-2019. Your Smart Plug can be controlled through your existing Wi-Fi network via the free Kasa App. Download the app to your smartphone or tablet and have access to turn your home devices on or off, set schedules. The Kasa app allows you to add as many Smart Plugs as you'd like to keep track of multiple appliances. 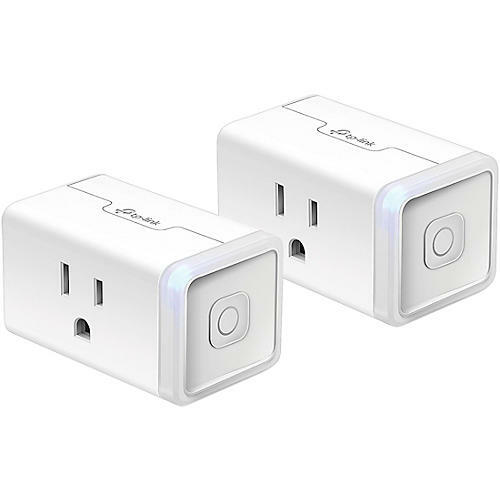 Have the Smart Plug work for you when you're out of town. Connecting a lamp to your smart plug can provide home security benefits. Set it to Away Mode, and the Smart Plug will automatically turn the light on and off to give the appearance that someone is home. Compact housing makes the HS105 considerably small than other smart plugs. With a thickness of just 1.5 inches, the smart plug mini blends into your outlet and any room's decor without blocking adjacent power sockets. Kasa and our partners make your smart home devices work better for you. Use voice control with an Amazon Alexa, Google Assistant, or Microsoft Cortana device. Plus, make your smart home more connected with IFTTT or Nest.